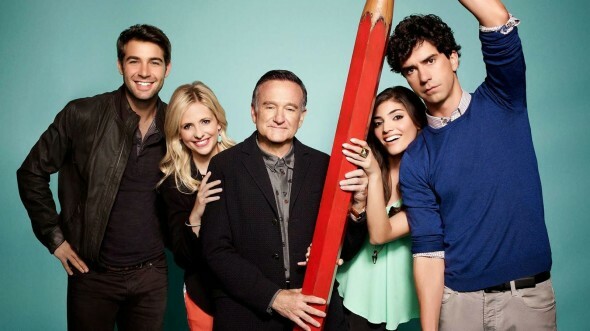 Mork & Mindy was a smash hit back in the day but the same can’t be said for Robin William’s newest sitcom, The Crazy Ones. CBS has cancelled the show after one season of 22 episodes. The Crazy Ones follows an unorthodox ad agency executive (Williams) and his partner and daughter (Sarah Michelle Gellar). The rest of the cast includes James Wolk, Hamish Linklater, and Amanda Setton. Word is that the show was expensive to produce and the ratings just didn’t justify a second season. It was the weakest-performing comedy on the network’s Thursday night schedule for much of the year, averaging a 2.1 rating in the 18-49 demographic with 8.32 million viewers. The season (now series) finale aired on April 17th. What do you think? Are you sorry to hear that The Crazy Ones has been cancelled? Do you think it should have been renewed for a second season? No kidding. I also believe this is what may have led Robin Williams to take his life. So sad. I miss Robin Williams very much to this day. His hu more was one of a kind, and he’ll NEVER be duplicated. He left a legacy and shoes that’ll NEVER be filled. HUMOR, not hu more. I hate auto-speller on iPad! I discovered this show a little while ago. I saw it and loved it. Robin Williams made me crack a lots of smiles and giggles, sometimes even laugh! I don’t laugh easily.. I’m mostly a sad person trying to look okay. This kind of shows that are like a never ending comedy film really light my day. It is such a pity they canceled it. I also read that this cancellation lead Robin Williams to commit suicide. He was a big lose.. Why comedians and fun people have to get depressed? Yes, there should be a season two. Just saw and watched the season on Netflix. First I had heard of it since like several in my area we just rely on streaming. I loved it. I laughed out loud several times. I know RW is gone but the show was a success in my book. Sorry to hear there is not a season 2. They can’t leave us hanging. What happened with Andrew and Sydney. This was such a fun show. They Should definitely bring it back. Although Robin Williams was the major part i think it can still be Salvaged. I liked this when it ran on TV and saw some episodes. I finally saw the full season recently on Netflix. It was a good show, and I wish there had been more seasons. So sad to see Robin Williams. The episode where he gives a eulogy about seeing a man through his daughter’s eyes made me cry, thinking about his own children and how they must be grieving. What a terrible loss. I just watched the 1st 15 episodes in a row on Netflicks and would have kept watching if it wasn’t 3am. Loved seeing Robin Williams back on TV. Very very sad that CBS cancelled it. What a MONUMENTUS MISTAKE that can’t be rectified. For shame CBS execs, for shame. You cancelled a great show before it’s prime. I would have rather watched The Crazy Ones before the new Odd Couple any day! It should definitely be renewed!!!!! PLEASE PLEASE PLEASE LET THERE BE ANOTHER SEASON OF ‘The Crazy Ones’ I have never laughed so hard in my life!!!!!!!!!!! It is probably one of the best shows in the world by far.